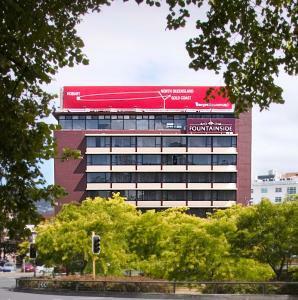 Situated in the heart of Hobart, Fountainside Motor Inn Hotel Hobart provides comtemporary luxury hotel accommodation with all of Hobart's attractions at your fingertips. Stroll down to Salamanca Market and Battery Point, dine in one of the many restaurants along the waterfront precinct, or take a short drive to Mt Wellington, the Cadbury Chocolate Factory or Wrest Point Casino. The Fountainside Hotel is close to everything that Hobart has to offer and features numerous guests facilities including lounge bar, faxing facilities, free car parking, guest laundry, lift, restaurant, room service, tour desk, airport shuttle, 24 hour reception and daily housekeeping. A 15-30 minute drive will take you to the airport, historic Richmond Village and south to Kettering to board the ferry for Bruny Island. Within an hour you can reach the historic Port Arthur site or the Tahune Airwalk in the Huon Valley. At Fountainside we offer friendly and caring hospitality in an endeavour to make sure your stay in Hobart is a memorable one. Nearby Attractions : Fountainside Hotel Hobart is easy walking distance to many restaurants in Hobart's waterfront precinct, Salamanca Markets & historic Battery Point, the Royal Tasmanian Botanical Gardens & the Hobart Aquatic Centre. A short drive to Mt Wellington, Cadbury Chocolate Factory, Wrest Point Casino, and the Domain Tennis Centre. A 15-30 minute drive will take you to the airport, Richmond village, and south to Kettering to board the ferry to Bruny Island. Within an hour you can reach Port Arthur or the Tahune Airwalk in the Huon Valley. King Hotel Room : Sleeps up to 3 guests on 1 King Bed & Rollaway Extra. Self Contained Studio Apt : Sleeps up to 4 guests on 1 Queen & 2 Single Beds. Superior King Hotel Room : Sleeps up to 2 guests on 1 King Bed. Twin Hotel Room : Sleeps up to 3 guests on 1 King & 1 Single Bed.